When I’ve finished a particularly long or grueling workout, I look forward to three things: a glass of chocolate milk, a hot shower and putting on socks. I was skeptical at first. I mean, I’ve worn knee socks before and not noticed any real benefit (other than, you know, looking wicked-sweet). But enough of my super athletic friends swore by them that I finally purchased a pair. And then another. And another. And I’m always on the lookout for another pair. Look, I’m no scientist—I was an English major, after all, so I’m not going to go into the details of why they may or may not work for running and recovery by increasing blood flow and circulation. But I know what feels good, and compression socks on my tired, sore legs? That feels awesome. I agree! I love long sox after a workout! Haven’t tried them but it sounds like a great idea! I will have to try it. Usually after I go for a run my legs are a bit sore so maybe this would help. YES! 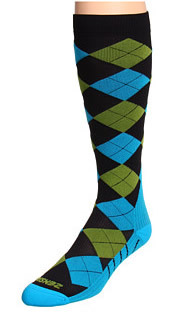 I love compression socks–I often run in them too–I love them on trails! I’m a nurse and I wear them at work. Except in the winter I have problems with static. Any one have a my tips on how to get rid of the static so my pants aren’t clingig to my socks?